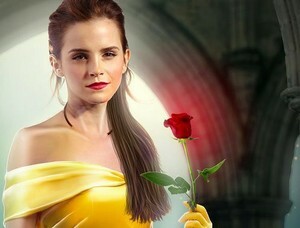 Emma Watson / Belle. . Wallpaper and background images in the Beauty and the Beast (2017) club tagged: photo emma watson belle beauty and the beast 2017. This Beauty and the Beast (2017) photo contains boeket, corsage, ruikertje, bouquet, and posy. There might also be portret, headshot, and close-up. perfect actor's squard! already excited) let's make after Belle the LittleMermaid with Emma Robertson!